SYDNEY, N.S. — Prince Edward Island skip Suzanne Birt is not intimidated on the ice, no matter who the opposition might be. 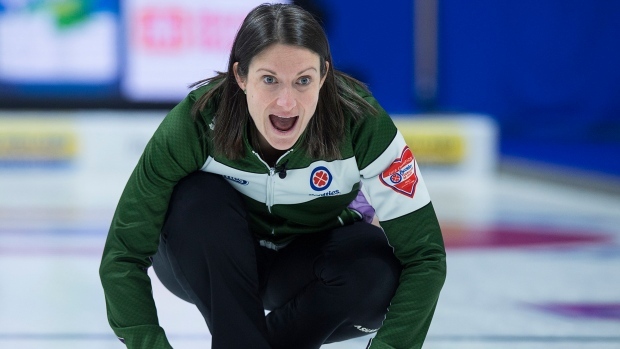 She used an aggressive style against six-time Scotties Tournament of Hearts champion Jennifer Jones on Monday and it paid off with an 8-6 victory at Centre 200. "I think Suzanne (going) back to her junior days has just had 'it,' especially when she has draw weight," said P.E.I. coach Mitch O'Shea. "I think she feels like she can make everything. "Her confidence is pretty good right now so it'll be good going through the rest of the week." Birt continued her solid play in the evening with an 8-4 win over Yukon's Nicole Baldwin while Jones dropped a 9-6 decision to New Brunswick's Andrea Crawford. A world junior champion in 2001, Birt won a bronze medal at her first Scotties appearance in 2003. She improved to 2-9 lifetime against Jones, with the other victory coming at the 2011 national playdowns. "I just think we put a little more pressure on," Birt said. "We were getting our rocks in good spots and made them try to make shots. They struggled (with) a few shots early on so we just kept the pressure on and tried to capitalize." Jones scored a pair in the opening end before Birt posted three straight deuces thanks to a pair of steals. The teams exchanged singles until Jones stole a pair in the eighth end to make it a one-point game. After a blank, Birt had hammer in the 10th and won it with a single when Jones's final stone overcurled. All four members of the Winnipeg foursome — Jones, lead Dawn McEwen, second Jocelyn Peterman and third Kaitlyn Lawes — struggled at times in the early game. Peterman flashed a throw in the seventh end and McEwen hogged her first stone in the ninth. Jones finished with a weak shooting percentage of 58 per cent. The veteran skip improved slightly to 63 per cent in the night game. "It's just one of those days that you just want to forget and move on to tomorrow," Jones said. "It's a long event." Birt, a 37-year-old Charlottetown resident, has played in six events this season and is ranked 25th in the country. She beat Crawford to win a World Curling Tour event last December and topped Veronica Smith in last month's provincial championship. Birt is making her first Scotties appearance since 2016. Her lineup includes third Marie Christianson, second Meaghan Hughes and lead Michelle McQuaid. "I think if we get on a roll, we can easily do some damage moving forward," Christianson said. In the other night games, Team Wild Card's Casey Scheidegger beat Kelli Sharpe of Newfoundland and Labrador 8-5 and Kerry Galusha of the Northwest Territories defeated Saskatchewan's Robyn Silvernagle 9-4. Birt, Scheidegger and Galusha lead Pool B at 3-1. Jones, Silvernagle and Crawford are next at 2-2. Two Pool A teams remained unbeaten after the afternoon matchups. Ontario's Rachel Homan and Alberta's Chelsea Carey posted victories to improve to 4-0. Homan thumped Quebec's Gabrielle Lavoie 12-2 while Carey needed an extra end for a 9-8 win over British Columbia rookie Sarah Wark. "For us to be able to just hang in there and drag it out, I think it says a lot about the fight that we have in us," Wark said. "So I think if we can put together a good game — all four of us players altogether — we're going to give some teams a real good run for their money." Manitoba's Tracy Fleury defeated Nova Scotia's Jill Brothers 9-4 and Northern Ontario's Krista McCarville beat Nunavut's Jenine Bodner 9-3. Wark was alone in third place at 3-1, with Northern Ontario and Manitoba next at 2-2. The top four teams from each pool in the preliminary round will qualify for the championship round starting Thursday. The playoffs start Saturday and the final will be played Sunday. Notes: McEwen was named the greatest Canadian female lead of all-time in a survey released Monday by TSN. She finished well ahead of Marcia Gudereit and Lisa Weagle in the voting by a panel of broadcasters, reporters and elite-level curlers.